Stephen Duckett, the former CEO of Alberta Health Services, says privatization is among the reasons why Alberta’s health costs are so high. The former head of Alberta Health Services says there are several reasons why Alberta consistently has the highest health costs and worst outcomes in Canada: provincial wealth, politics and privatization. 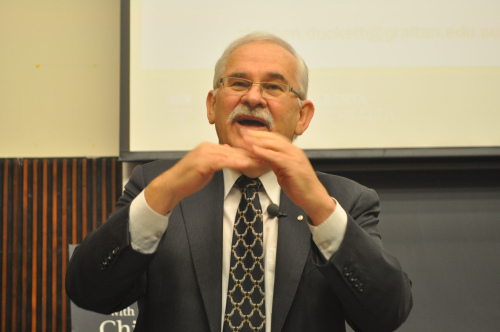 Stephen Duckett, speaking September 17 in Toronto at Longwood’s Breakfast With The Chiefs, was President and CEO of Alberta Health Services from 2009-10. An Australian economist who still lives in Alberta, Duckett says that he inherited a situation where cataracts were outsourced in Calgary and Edmonton. The “unusual” method of tendering these contracts encouraged providers to bid high. Instead of giving contracts to the low bidder, Alberta Health Services took all the bids, set a uniform price by averaging the costs in the tenders, then made “everyone a winner” by contracting the service to all of the submitting companies. J. Darcy: If you ask British Columbians and Canadians what they cherish most about the society we live in, the majority inevitably say that it’s our cherished public health care system. We are passionate about it. It’s central to who we are. We have a health care system, a medicare system, where the quality of care you get does not depend on the size of your pocketbook. If you visit a doctor’s office or an emergency room, if you’re scheduled for a diagnostic test or a surgical procedure, you’re asked to show your CareCard, not your credit card — for now, that is. But this fundamental value that we share as British Columbians is under threat. It’s being challenged in a court case launched by Dr. Brian Day and his associates at Vancouver’s for-profit Cambie surgical clinic and specialist referral clinic. These private clinics have been actively flouting the law in B.C. for many years by extra-billing patients for medically necessary procedures, and they’ve been getting away with it. The goal of their legal case is to allow a parallel U.S.-style private insurance scheme to flourish for essential medical services, the kind of system that has driven U.S. health costs up 50 percent higher than ours, while leaving millions of Americans underinsured or uninsured. (Citizens of British Columbia have sent over 1300 messages to the BC Government. )Thanks to our collective call for action, Minister of Health Terry Lake responded publicly about the resolution for the first time: “The priority of the Medical Services Commission, and the Ministry of Health, is to uphold the Medicare Protection Act and the benefits it safeguards for patients in this province. We expect and require these clinics to come into full compliance with the law. If that goal can be reached through an alternative process agreed to last month, we are willing to explore that with the other parties. If we are unable to reach an agreement through this process, we will go to the court for resolution. “ Receiving this statement shows us that Minister Lake is paying attention to the campaign. Between now and the end of December, Princeton and Area will have 6 locum physicians coming to assist our practitioners in providing health care services to our community. We’d like to make these doctors feel at home while they are here and give them a warm welcome. We are organizing this campaign to show our appreciation during this time when our community is experiencing a doctor shortage and hope it will leave a positive impression on the locums who might be looking for a community to set up a long term practice. If you would like to be a part of the Love a Locum campaign, you can help by providing such things as home cooked meals, canning, gift certificates, lessons by skilled people (fly fishing, horseback riding, cross country skiing, etc.). Please phone Lori Thomas at the Chamber of Commerce (250-295-3103) to make a contribution.